"This tangy, veggie-filled, one-pot dish can be made quickly with canned or fresh ingredients. This goes great with a crusty garlic bread or cheesy bread." Bring a large pot of lightly salted water to a rolling boil. Cook the spaghetti at a boil, stirring occasionally, until the tender yet firm to the bite, about 12 minutes; drain and set aside. Heat olive oil in a large saucepan over medium heat; cook and stir the spinach and mushrooms in the hot oil until they give off their liquid, about 10 minutes. Add the red wine vinegar and balsamic vinegar; bring to a boil. Stir the tomatoes, basil, parsley, and black olives into the boiling mixture; continue cooking and stirring, until the flavors blend, about 10 more minutes. Mix the cooked spaghetti into the tomato mixture and reduce heat to medium-low. 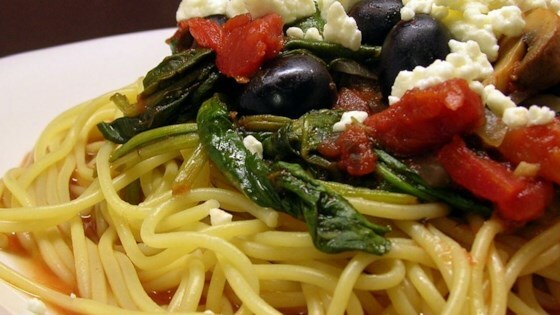 Simmer the pasta and sauce until the flavors have blended, 8 to 10 minutes; stir the feta cheese into the pasta. Sprinkle with more feta cheese to serve. Used a bit less balsamic vinegar. I think next time I will use even less. It was pretty good. Thinking about preparing this Italian based. It was delicious! A bit too tangy though... any suggestions on reducing that would be appreciated. This is a great veggie dish that is easy, tangy and healthy. Thanks for sharing! I liked it. Easy to make and very tasty too. This was fantastic. I will make this often, just as written.